I’ve been a Dunlop Jazz III player almost exclusively since about 1997. I had been a purple Dunlop 1.14mm guy for years but one day my guitar teacher at Berklee , Norm Zocher, was using one in one of our classes and we were talking about what a cool pick it was and how given the small size and narrow point how much more was more exact it was. Almost like a sharpened pencil or scalpel. He ended up giving me one of his extras and I started playing with it. Honestly my change over wasn’t even a gradual thing, it was immediate. From that day forward I never used anything else. At this point large picks feel like I’m trying to play guitar with a roofing shingle or something. On top of that they feel like an extension of my body, and when held and player correctly you almost feel, and it sounds, like the pick isn’t there. I tend to use the Red Jazz III’s the most, although I have tried all of them. I find the blacks a little too dull and the Ultex’s a little too slippery and bright. The black grips are probably my least favorite, only because I tend to move the pick around a lot while playing, either switching between finger picking and back, or just to get different tones out the guitar. So the grip make it’s more difficult to adjust. As for other picks, I do keep an assortment of thin picks around for occasionally recording acoustic guitar. As much as I love Jazz III’s, they don’t have that percussive “Pick” sound, which sometimes you want when strumming an acoustic guitar for effect while recording. Most of the time though I just record with the Jazz III or my fingers. My number one go to brand of strings are Ernie Ball Regular Slinky's. 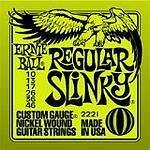 (The Green package) I’m not sure how I ended up being an Ernie Ball fan, but somewhere along the line in the early 90’s I became a Slinky player and just never switched to anything else. Not to say I haven’t tried almost every other brand, but for the price and quality, Ernie Ball’s just seem to be the perfect fit. The stay in tune, they don’t break often, the sound good and they don’t hurt the pocket book. I can’t remember the exact first gauge’s I used, but back when I owned by Gibson around 1993 I was a 10-46 person, but around 1994 when I purchased my Ibanez Jem555 I moved over to the 9-42 pink Super Slinky’s. I was definitely into more of the shredder rock thing, and lighter gauge seemed more appropriate with that guitar. During the recording of my first 3 4-track albums, and all through the Aesthetik days I used nothing but 9’s. I can’t remember exactly when I switched to the Regular Slinky’s. It was most likely in the late 90’s, but by around 2000 I was stringing all of my electric guitars with Ernie Ball Regular Slinky 10-42. I liked the 9’s, but found the 10’s just had more power to them and sounded better when recorded. They are just the perfect middle ground of gauge size for me. When I first got my Washburn N4 I strung it up with Dean Markley Blue Steel's and then GHS Boomer's. All 9-42. I was trying out the different string brands and gauges I had heard Nuno Bettencourt had used or endorsed over the years, and wanted to make the guitar as pure to the original as possible. (I even kept it tuned to E flat) After about a year I ended up just going with the Slinkey’s 10-46 since I really didn’t hear or feel a huge difference, and the Ernie Ball’s were cheaper. Around 2009 I started stringing my Washburn N4 with the Nuno Bettencourt signature Dean Markley's. I choose to use the heavier, 10-52, strings. It’s actually pretty insane having that super low E string, but I figured if that’s what Nuno is using, that’s what my Nuno guitar needs. So since then the N4 has been strung with nothing but the signature strings. It definitely helps with the Floyd Rose’s stability. The lighter gauge and free floating trem would often detune easily with huge bends. The heavier gauge helps even it out. Also the thicker low strings adds HUGE “CHUNK-a CHUNK-a CHUNK” low end while playing. For my acoustic I’ve always just used the Martin Bronze Wound, 12-54. They sound amazing when brand new (especially great for recording), however tend to lose their luster and brightness pretty quickly. I do find they last forever though. Since I may not always be recording acoustic guitar I’ve actually had them last up to a year or more without changing. What can I say, they’re dependable. In 2010 I started using Ernie Ball Power Slinky's, the 11-48 guage, for my Fender strat. I was a little hesitant since I figured they’d be overly tight and hard to play, but found them to be surprisingly easy. It’s definitely much more difficult to bend, but the reason I only changed to this gauge for this guitar was to get a heavier and more percussive strat tone out of my Strat while playing full chords. And well… it does exactly that. The higher tension and thicker strings really allow you to dig in without going out of tune. When they’re new they have a huge deepness and almost bass string quality for playing bright single notes on the low string. I like them a lot. I definitely wouldn’t put them on my Warmoth, or any guitar with a tremolo, but for more aggressive chord word, especially with the Fender tones (think Stevie Ray Vaughan attacking the guitar), I’m really enjoying the heavier guage on my strat. In the end though, for every one package of alternate strings I have, I have 5 packages of Green Regular Slinky’s. What can I say, they are my #1 string of choice.